An action-packed opening WorldSBK encounter saw Alvaro Bautista take a seventh win of the 2019 MOTUL FIM Superbike World Championship season. It was a thrilling battle for second position though, as a seven-bike train soon began to frantically swap places, resulting in a thrilling final few laps. Bautista got a dream start, blasting clear into the lead by Turn 1. However, there was drama behind as Jonathan Rea (Kawasaki Racing Team WorldSBK) and Markus Reiterberger (BMW Motorrad WorldSBK Team) collided on the line, leaving the German rider on the floor in the middle of the pack. He was able to get up, but his race was certainly over. Tom Sykes (BMW Motorrad WorldSBK Team) was able to give some positivity to the German manufacturer, as he got into second position, ahead of Alex Lowes (Pata Yamaha WorldSBK Team). There was more carnage on the opening lap, as Leandro ‘Tati’ Mercado (Orelac Racing Verdnatura) and Alessandro Delbianco (Althea Mie Racing Team) crashed at Turn 12. Chaz Davies (ARUBA.IT Racing – Ducati) was moving up the order very quickly, into fourth by Lap 2, racing up from eighth on the grid. Jonathan Rea had also made a great start, up to fifth position, whilst the rider who had suffered the most in the opening laps was German, Sandro Cortese (GRT Yamaha WorldSBK), who was now down to seventh as Michael van der Mark (Pata Yamaha WorldSBK Team) moved through on his Yamaha compatriot. As the race progressed, a mistake from Alex Lowes at the final corner allowed Jonathan Rea and Tom Sykes to come through, whilst Chaz Davies also got in on the action. Four riders, representing four manufacturers, side-by-side down the straight for second position. Meanwhile, way out in the lead, Bautista achieved a new lap record, with 1’49.755 cementing his position as the rider to beat in WorldSBK. Tom Sykes soon dropped back behind the main protagonists but Eugene Laverty (Team Goeleven) was right in the mix, picking up places and soon, was amongst the leading group. The Irishman made it into fifth position in the final third of the race, before also making a bold move with three laps to go on Lowes at Turn 12. The Irishman was now fourth and looking good for a podium. Jonathan Rea was looking good for second place and continuously hounded Chaz Davies through Turns 3, 4 and 5. Rea led the battle going on to the final lap, with Davies all over the rear-end of the reigning four-time champion. Eugene Laverty was able to make his way to the back of the duo, looking hard for a way ahead of Davies. Into Turn 14, Davies was lining Rea up for a move down the back straight before Eugene Laverty clipped him and crashed out. Davies stayed aboard but the damage had been done. 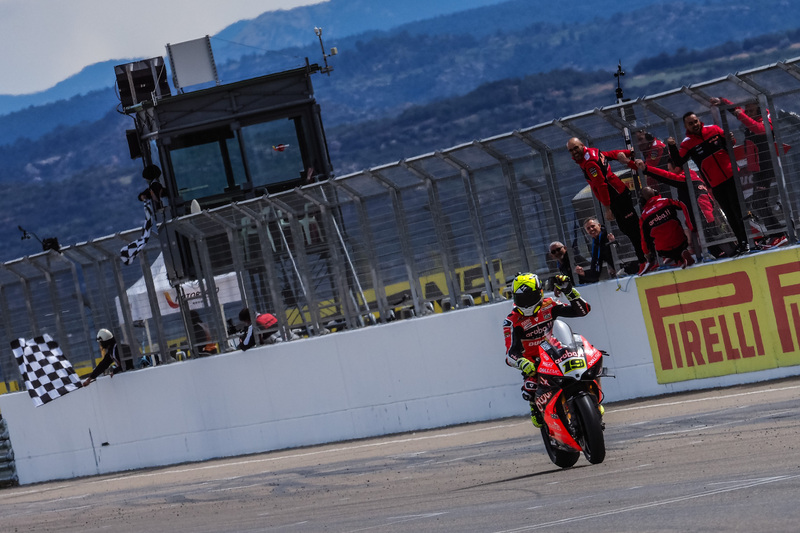 Completing the race without any such drama, Alvaro Bautista took a seventh win, whilst Jonathan Rea took a seventh second position and Chaz Davies in third place – his first podium of the 2019 season. Laverty’s crash promoted Alex Lowes to fourth and a resurgent Tom Sykes, who picked off Cortese and van der Mark in the closing laps. With Sykes fifth with the Dutch and German stars behind, eighth place was taken by Toprak Razgatlioglu (Turkish Puccetti Racing), ahead of a disappointing Leon Haslam (Kawasaki Racing Team WorldSBK) in ninth and top Kawasaki after Tissot Superpole, Jordi Torres (Team Pedercini Racing); the 31-year-old Spaniard taking his first back-to-back top tens of the season. Outside of the top ten, it was Leon Camier (Moriwaki Althea Honda Racing) ahead of a dejected Marco Melandri (GRT Yamaha WorldSBK), with second-row starter Michael Ruben Rinaldi (BARNI Racing Team) down in 13th. Ryuichi Kiyonari (Moriwaki Althea Honda Racing) and disappointed Eugene Laverty concluded the points. Bautista’s win makes it 348 for Ducati, meaning an iconic 350 at Aragon this weekend can still happen. It is his seventh consecutive win and Spain’s first at a Spanish circuit since Ruben Xaus in Race 1, at Valencia in 2007 – also riding a Ducati. Chaz Davies’ podium means it is the first time two Ducati riders have been on the same podium in almost an entire year: MotorLand Aragon Race 2. The World Supersport championship returned to the MotorLand Aragon circuit in dry conditions for the Tissot Superpole session. A flurry of action at the end of the session saw Thomas Gradinger (Kallio Racing) become the first Austrian to secure a pole position in the history of the WorldSSP championship. The Austrian rider put in a great lap with a masterful last sector to secure Austria’s first pole position in WorldSSP history. Gradinger also becomes the first Austrian since Christian Zaiser at EuroSpeedway Lausitz in 2007 to start on the front row. Second position on the grid went to Federico Caricasulo (BARDAHL Evan Bros. WorldSSP Team), whilst his teammate, Randy Krummenacher, completed the all-Yamaha front row. Heading up row two, championship leader Jules Cluzel (GMT94 YAMAHA) will hope for a fast start in order to battle hard to retain his championship lead, with him and Krummenacher level on points. Isaac Viñales (Kallio Racing) was fifth, with Raffaele De Rosa (MV AGUSTA Reparto Corse) in sixth, the first non-Yamaha on the grid. Row three will see 2017 WorldSSP champion Lucas Mahias (Kawasaki Puccetti Racing) in seventh and less than half-a-second from pole position. Corentin Perolari (GMT94 YAMAHA) finished in eighth place despite a fast crash at Turn 16, with Japanese star Hikari Okubo (Kawasaki Puccetti Racing) in ninth. Completing the top ten was Hannes Soomer (MPM WILSport Racedays) for Honda, making it the second time in three Superpole sessions in 2019 that all four manufacturers have enjoyed top ten representation. Two frenetic WorldSSP300 Tissot Superpole sessions saw action and drama right the way through, with Manuel Gonzalez (Kawasaki ParkinGO Team) qualifying on pole position from Group A. Joining him on the front row also from Group A is Indonesian rider, Galang Hendra Pratama (Semakin Di Depan Biblion Motoxracing) who is second, with fellow Group A rider Hugo De Cancellis (Team Trasimeno) completing the front row. With a gap of just 0.020 between first and second, it really is going to be a hard race to call on Sunday. Row two sees Marc Luna Bayen (Kawasaki GP Project) in fourth place, ahead of the first of the Group B riders, Andy Verdoia (BCD Yamaha MS Racing), as the 16-year-old placed well in his fourth WorldSSP300 race of his career. Completing the second row is Guillem Erill (DEZA – BOX 77 RACING), making it three Spanish riders on the front two rows at home in Aragon. Reigning champion Ana Carrasco (Kawasaki Provec WorldSSP300) will start 13th, whilst fellow title rival and 2018 3rd-placed overall Scott Deroue (Kawasaki MOTOPORT) is only 15th. Marc Garcia, the returning 2017 WorldSSP champion could only manage 24th at his home circuit on his come back. The first ever WorldSSP300 last chance race was a thrilling encounter, as we awaited the six riders to come through to join the main grid on Sunday. Winning the race for the first time, Dutchman Jeffrey Buis (MTM Racing Team) was able to hang on the leading group of three, which consisted of Italian Jacopo Facco (Semakin Di Depan Biblion Motoxracing) and Brazilian, Eliton Gohara Kawakami (BCD Yamaha MS Racing). Behind the leading trio, a familiar name but a different rider: Bahattin Sofuoglu (Turkish Puccetti Racing by TSM) finished 10 seconds behind the winner but in fourth place, meaning he had done enough to get himself on the grid for the main race on Sunday. Joining him, Australian Tom Bramich (Carl Cox-RT Motorsports by SKM-Kawasaki) and Frenchman, Joseph Foray (Prodina IRCOS Kawasaki). Just missing out behind the second trio was French rider, Romain Dore (Team MHP Racing-Patrick Pons) and Portuguese rider, Tomas Alonso (Kawasaki GP Project). With six different nationalities from this race going through to compete in tomorrow’s main WorldSSP300 race, it highlights the international mix to the championship, whilst also the parity that it can bring to the motorcycling world. “We worked a lot during the winter test and yesterday and today it was a good Tissot Superpole. My lap was not perfect but it was enough to get me into pole position. I am sure tomorrow we will be able to fight for the win or for the podium. Thanks to everybody and I am looking forward to tomorrow”.